Another once in a lifetime sighting this week. We found the Marthly Male mating with the Maxabene Female, north of the Sand River, on Marthly. 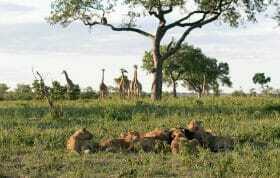 They were near a termite mound that was housing a warthog family. 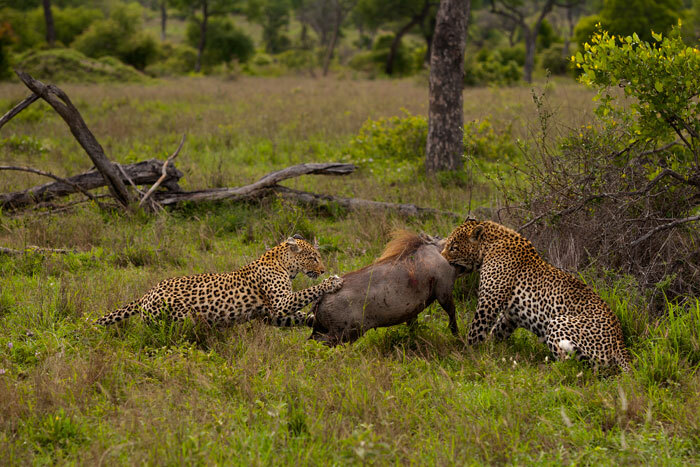 For some reason, despite knowing the leopards were there, the warthogs came running out, and one was seized by the big male leopard. 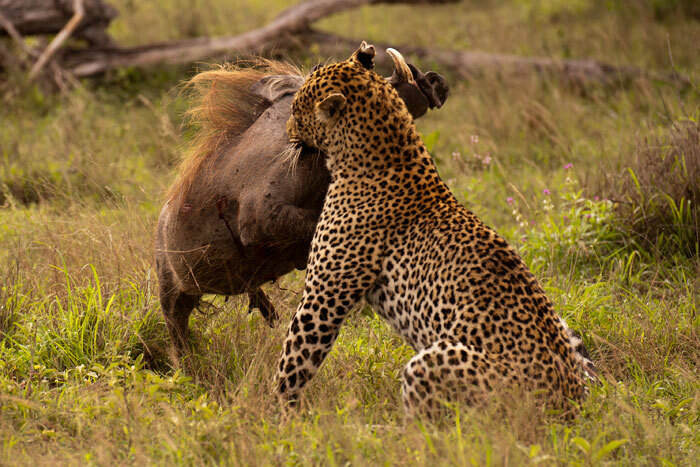 Warthogs are strong creatures and it took a lot of effort for him to grab this large sow by the throat. 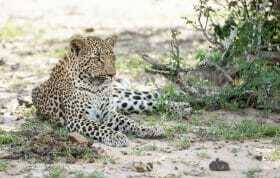 The female leopard (Maxabene) even came in to ‘help’ – although the male ended up doing most of the killing! 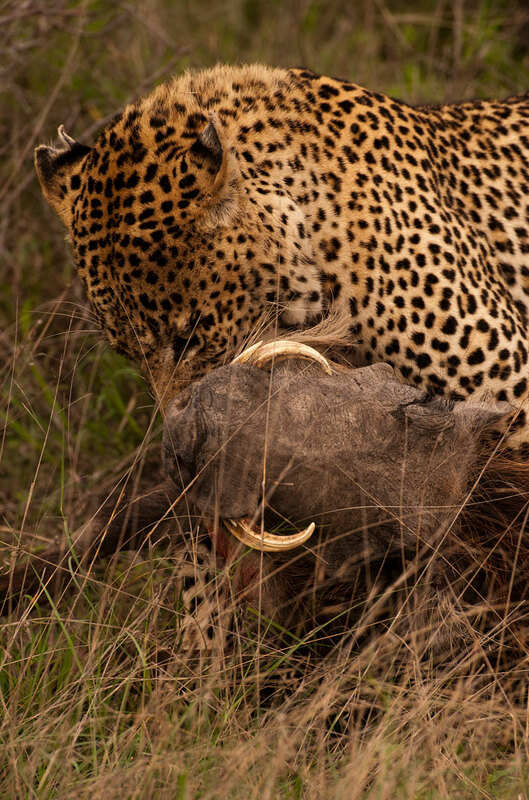 As the male suffocated the warthog, the female began feeding. If you are a regular follower of our blog, you might remember we had the exact same thing happen the last time we saw the Marthly Male and Maxabene mating (about 6 months ago). Interestingly enough, this warthog’s burrow was only about 100m from the burrow of the previous incident! 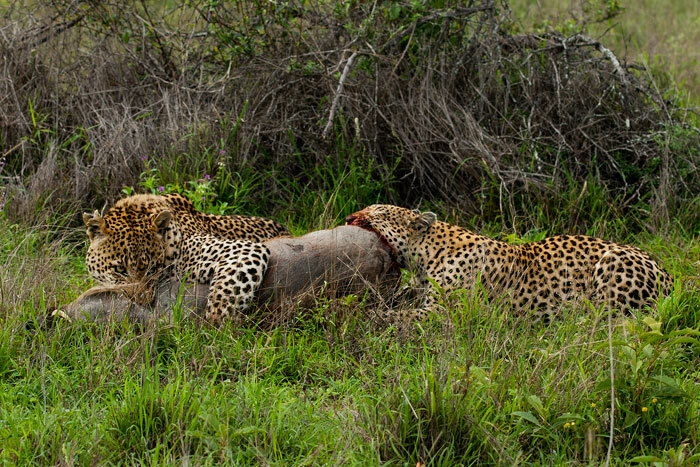 The Maxabene Female was not helping as the Marthly Male tried to drag the carcass to cover. She half-heartedly tried to keep feeding on it. 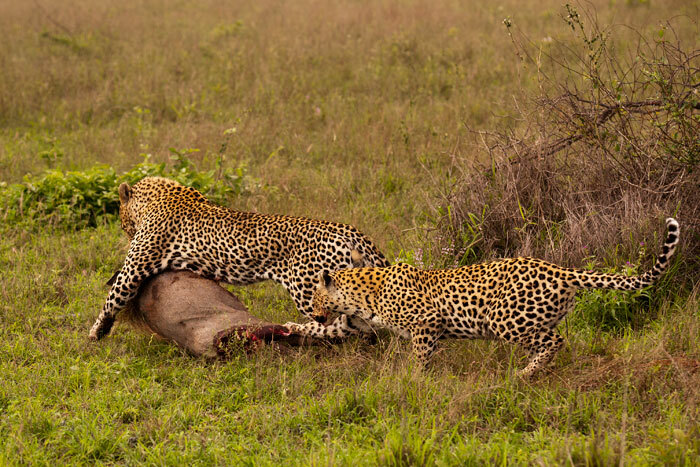 However, just like we witnessed the last time, neither leopard was aggressive in any way towards the other when it came to ‘sharing’ – there was never any growling or competition over the kill. 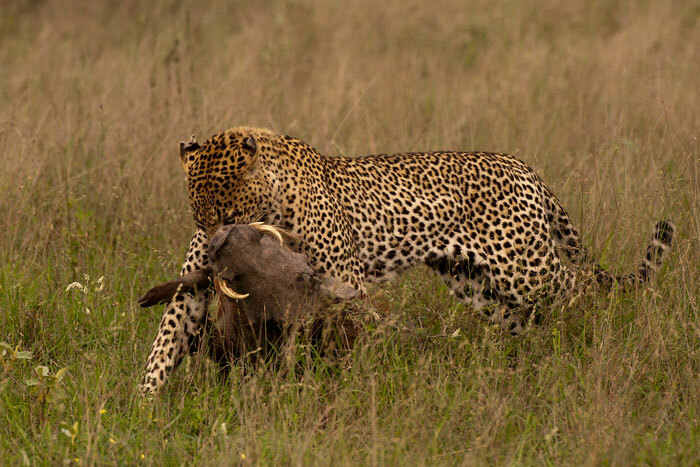 It is an incredible sight to witness a leopard dragging a kill, particularly a heavy warthog like this. The Marthly Male kept stopping for a break every 20m or so to catch his breath. 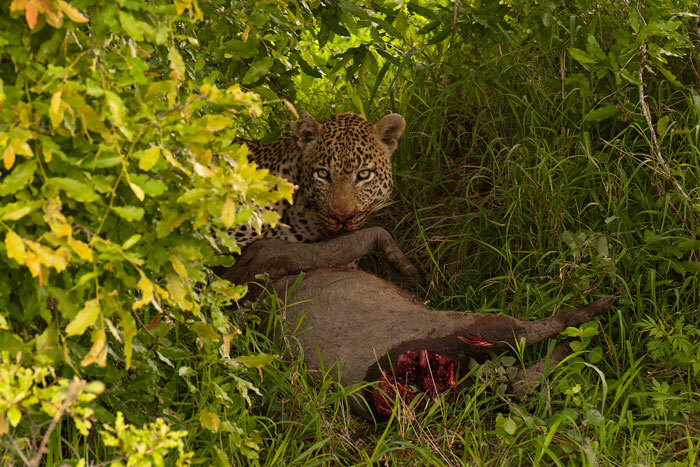 Determinedly, he eventually reached an ideal location – a thicket at the base of a Jackalberry tree which would be easy to hoist the kill into, if he was under any pressure from hyenas or other predators. Once safely stashed away, the Marthly Male could feed in peace, occasionally watching the circling vultures approaching. The warthog would be too heavy for him to hoist until they had fed on a significant portion of it. The Maxabene Female rested nearby but came to feed again a bit later. These stunning pictures were made possible thanks to our fantastic tracker Freddie and ranger Talley who found the subtle tracks of these leopards! But what happened to the cub Maxabene gave birth to in September? Is it dead? Christer, we too have enjoyed the amazing tracking talents of Freddy, but what a special experience and your video is stunning! Thank you for sharing it. Talley, as usual your photographs are brilliant. 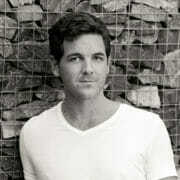 I say the same thing again, and again, and again but I’m so thankful for this blog! 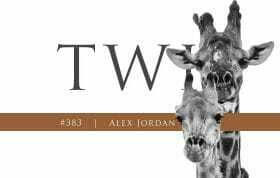 While I sit here so far away in Philadelphia, your blog helps me feel so much closer to Londolozi! Well done everyone! Tal those photos are phenomenal!